We stayed at Kathrine's apartment during our time in Besançon, and it was wonderful! From the very first time we contacted her to the end of our trip, Katherine was great to work with. We unfortunately speak only a little French, but she was very patient with us and communicated with us mostly in English. Katherine greeted us upon our arrival and made us feel very welcome. It was an added comfort to know that she lives in the building adjacent to the apartment in case we needed anything. We felt very safe with the gated and locked entries into the building. The apartment itself was very comfortable (felt like home), and it worked great for our family of three (our daughter is three years old). Our favorite thing about Katherine's apartment is the location! As soon as you step outside of the building, you are in the heart of the city! This was perfect, because everything we wanted to explore was within walking distance! While my husband was at work, my daughter and I browsed the shops, visited the open-air markets, and played at the parks. Parc Micaud and La Gare d'Eau are beautiful parks just a short 10-15 minute walk away (if you don't want to walk, the tram and bus stops are very convenient, too). Just about anything you might want or need during your stay is less than a 5 minute walk -- laundromat (just down the street! ), post office, pharmacy, supermarket, etc. While we loved the location of the apartment, the hustle and bustle in the area did take a little getting used to. There is a training school next to the building, as well as several restaurants/bars, and although the noise wasn't a big disruption, it may be something to consider. (Granted, we come from a small Midwestern town that is much, much smaller than Besançon). My husband has been to Besançon several times before, but this was the first time for my daughter and me. We couldn't have asked for a better experience. We absolutely loved making it our home for the few weeks that we were there, and we were very sad to leave. The memories we made during our trip will be cherished forever. We are already looking forward to going back and staying at Katherine's apartment again. The appartement is located in the pedestrian zone, so restaurants, shops, museums und the citadel are in walking distance. It is oriented towards an internal court where we had a private parking. The court is savely closed at night. The remote control for the door opens also the entrance to the pedestrian zone. At first arrival, I told our destination at the phone near the barrier and the guard immediately oppened the barrier, absolutely easy, no discussion. The host already waited for us and gave us a warm welcome at arrival. They life in the next building and are very helpful, even placed an extra table for us for doing some paperwork. The appartment was in good condition, clean, everything as described. WiFi without a problem. Heating made appartement warm also end February. 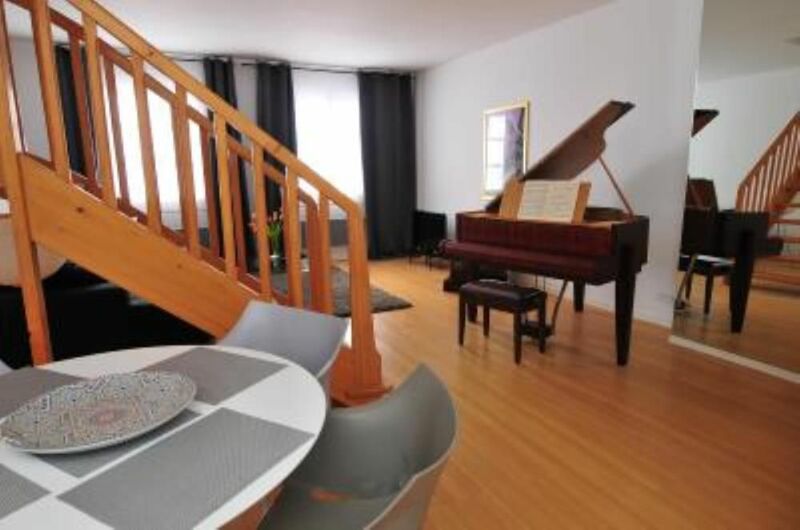 First time in life I played piano in a holyday flat! All kitchen and sanitry equipment workes well and is in good and clean condition, there is enought dishes and pans. The dishwasher is rather small but was sufficient. Besancon itself was very nice but also a good place to visit the surroundings, so we stayed a day longer than planned.